Does your home need a renovation? Do you often dream to move into another prettier house? There is a simple solution - instead of moving out of your property, renovate it. Fantastic Handyman strives to create the perfect living environment for you and your family by providing a full range of kitchen and bathroom renovations and repair services. Why choose our renovation solution? We only work with multi-skilled and reliable handymen. We train our technicians regularly to ensure we deliver each project to its highest standards. We’ll finish every job on time and budget, no matter the size of it. We understand that our business is nothing without our customers. We know we’re not perfect. That's why the customer feedback is important to us. Our goal is to improve the execution of the services every day. To be able to provide services exceeding your expectations, we need an adequate evaluation from our customers. Don’t worry about tools and equipment - our handymen bring everything they need to finish the job. If you’re not sure what kind of materials like paint, flooring or brackets to use, we can help. The technicians can give you guidance or even help you with supplying the products on your behalf. Keep in mind that the cost will be added later to your final bill. We know how much time means to you. That’s why we offer a variety of booking option to choose from. You can fill out our online booking form to request a service and a free quote or speak with our specialists by calling them on the phone or chatting with them live on our website. 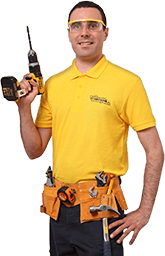 Fantastic Handyman takes pride in covering a wide range of home repair and property maintenance services. We appreciate your free time by offering combined services in a single day. If a pipe is leaking and needs to be fixed, you need a door lock repair or you need to mount a TV or a huge wall art, look no further. We can send a whole team to your property to take care of everything while you rest! We offer 7-days a week booking option and same day service when our technicians are available.